Add living, powerful electric guitar to your songs with Power Chords A-List Electric Guitarist, a Rack Extension for Reason. Play one-finger chord progressions from your MIDI keyboard and have full control over playing styles and sound. With Power Chords A-List Electric Guitarist, creating guitar tracks is dead easy. Thrust adds sweeping harmonics, controlled by aftertouch on Power Chords A-list Electric Guitarist. More content: 54 new styles and 67 new patches. With the flexibility and control of a real instrument and the ease of use of audio loops, Electric Guitarist is like adding a world-class player, on a top-notch instrument, in a tricked out studio to help with your music. Choose from a wide range of tones and playing styles. Just play your keyboard and Electric Guitarist delivers. From the lower octaves you can select alternate playing styles to add life and variation to your guitar tracks. Explore chord voicings live from your keyboard to get the perfect sound and style for your music. 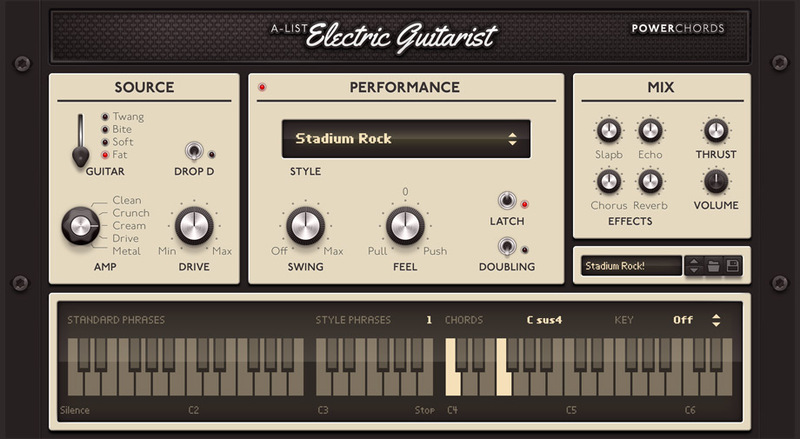 Electric Guitarist comes with more than 1000 rhythms, covering more than 90 styles that can be combined and played in real time to create unique, realistic and inspiring performances in a matter of seconds. Electric Guitarist also offers great control of the sound. Select instrument type, select amp type and dial in effects to sculpt just the sound to match your ideas. You can set the key of your song and Electric Guitarist will pick the right chords for you as you play one finger chord progressions. Or leave it off and have all chords and voicings available to you. Add sweeping harmonics, controlled by aftertouch. Select any of the 90 styles to find something that matches your ideas. Each style has 34 phrases that can be selected in real-time from your MIDI keyboard. For each style, there are 11 style-specific phrases and 23 ‘standard’ phrases that are common to all styles. There are over 1000 phrases in total. Clean, Crunch, Cream, Brit or Metal - pick on of the five amp models to shape your guitar sound. Sets how hard you want to drive your amplifier. How do you want Electric Guitarist to play? Just ahead, just behind or perfectly on the groove? Electric Guitarist comes with a set of built-in effects to help you get the sound you are after. Reverb, Chorus, Echo and Slapback can be applied. Electric Guitarist comes with more than 100 patches to help you get going.